As the air gets a little more crisp and the leaves change, pumpkins come into season and begin their world dominance (pumpkin spice has taken over every grocery store aisle!). Don't try to fight it–pumpkins will take over your crafting this fall! Find your perfect pumpkin pattern below and get stitching (and sipping, with PSL in hand). Pumpkin spice is everywhere. As soon as September hits, the pumpkin spice makes an appearance. Even every day household items have jumped on the bandwagon. There is pumpkin spice scented toilet paper. 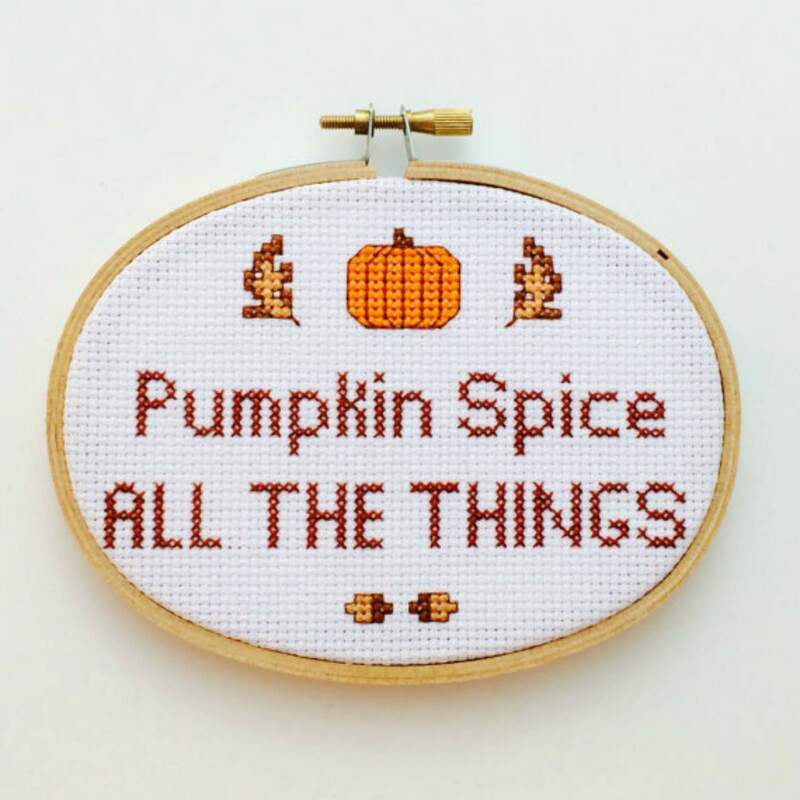 If you have a friend who is addicted to all things pumpkin spice, why not stitch them up a sampler that shows their spicy pride with this pattern from Bananya Stand. It pretty much sums up the entire fall season with just a few words. Wouldn't this look great in a coffee shop or as part of your fall decor? You can see this project and other fun patterns in their Etsy store HERE. If you can't settle on just one style of pumpkin, why not stitch up three different ones. The Daily Cross Stitch offers up their adorable stack of pumpkins. The one in the middle looks a little mischievous. You can get this pattern by signing up for their chart club. The club cost 5.99 a month and that gives you unlimited access to all of the patterns for a month. Or you can do yearly subscription for 19.99 and have unlimited access for a year. You can check out all the details and see the patterns offered HERE. Sometimes a whimsical pattern can also be upscale and fancy. Case in point, this beautiful piece by Alessandra Adelaide. This pattern, with all of its swirls is very detailed yet fun. It would look beautiful on a table runner or seasonal tablecloth. Surround the pattern with real pumpkins and fall leaves for a stunning autumn centerpiece. You can purchase this pattern at the Nordic Needle. They not only have patterns but tutorials and other gift items. You can see all items on their website HERE. It's time to think outside the fabric. Instead of just following a pattern and stitching it up on canvas, why not take your stitching to another level and cross stitch a pumpkin! You can do stitch on a real pumpkin or if you want to save it for years to come, you can stitch it on a plastic or foam one. Blog ala Cart shows you step by step how to cross stitch a pumpkin. Once you get the technique down, you can stitch just about anything on a pumpkin or gourd. This tutorial is honest and really gives you the pros and cons of stitching on a real pumpkin. Read all about it HERE. Not all pumpkins have to be orange, especially in the stitchy world. You can stitch up a beautiful quilt inspired cross stitch sampler with a pattern by Hands on Design. The blue quilt pattern against the white pumpkin is a nice contrast to the traditional colors of fall. This sampler would look wonderful in a country cabin. You could also change the colors up to match your decor. This pattern, as well as the supplies for it, can be purchased at 123 Cross Stitch HERE. Do you make a list of things you want to do for autumn? Play in the leaves? Drink apple cider? Lizzie Kate has created a series of autumn bucket list cross stitch patterns. Maybe stitching all of them up is on your bucket list. Carve a pumpkin should be the number one thing to do this fall. If you can't carve a pumpkin, why not do the next best thing and stitch up this pumpkin pattern. You can see all of the samplers and supplies HERE. Whether you love carving them, spicing them up or simply stitching them, pumpkins are the item for fall. They are a bright addition to the darker season. Happy fall stitching season! Donut inspired cross stitch, now with more sprinkles! Cross stitch patterns for the gamer in your life.